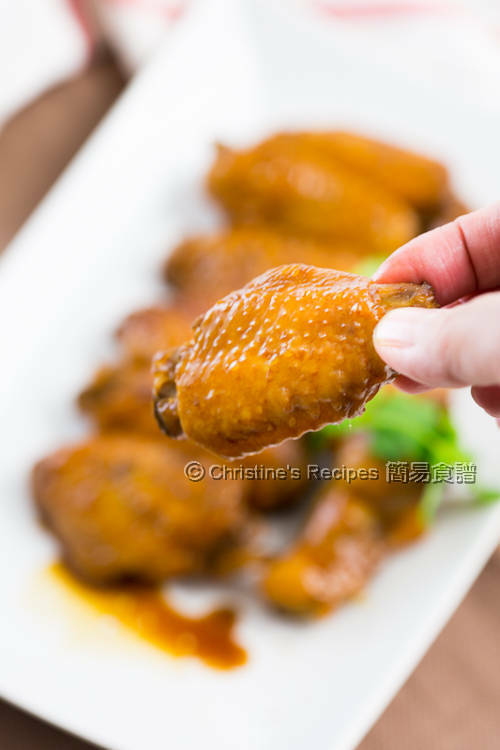 Several years ago, I posted a recipe, Braised Sweet Soy Chicken Wings, that’s also called “Swiss wings”. It’s made with a bottle of store-bought marinade. I’ve got thumbs up from my family. If you’re a wing lover and want to make this dish from scratch, go for this version. With only a few simple ingredients, you can make some flavoursome marinade to braise your chicken wings. It’s a not dish related to Switzerland. Why is it called Swiss wings any way? There’s a funny story spread around. A western customer asked the dish name after tasting at a popular Chinese restaurant. He misunderstood the Chinese waiter’s pronunciation of “sweet wings” as “Swiss wings”. Then this beautiful name, Swiss Wing was used ever since in Chinese community. 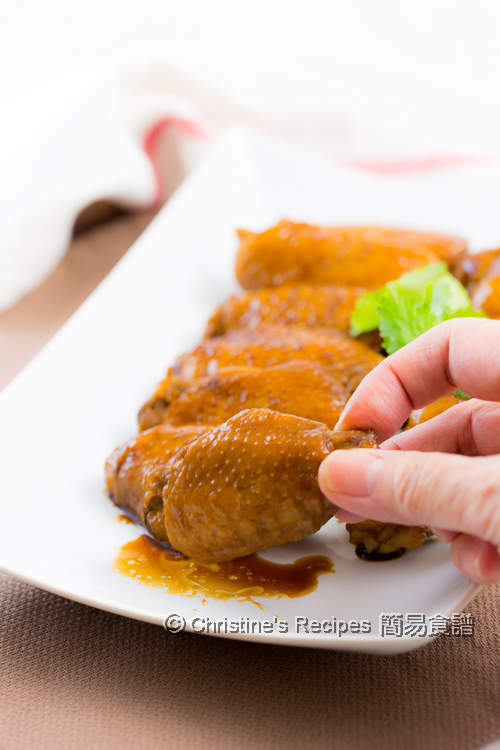 Swiss wings are similar to sweet soy sauce wings, but added some fragrant spices. To make this dish, basically, you only need light soy sauce and dark soy sauce, added with some popular Asian spices, Sichuan peppercorns, star anise and bay leaves. The aroma will be infused into your delicious Swiss chicken wings. Top left: spices. Bottom left: rock sugar. You’d notice that I use rock sugar (冰糖) instead of regular white sugar to make the sauce. Rock sugar is a kind of unprocessed raw sugar and it will give your sauce a depth of flavour, and your chicken wings a glossy and shiny look. You don’t need to cook the dish too long, yet its flavour is very addictively delicious. This recipe has become as my life saver on hectic days since I learnt to make it. 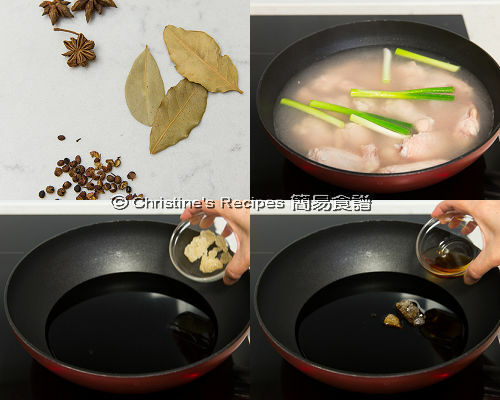 To get the best result, blanch chicken wings in a large pot of hot water, in order to remove blood and impurities, before cooking them in the sauce. The grease on the chicken skin will be removed too. It helps to brown your chicken wings evenly and beautifully. Put in ginger and spring onion in boiling water, blanch the chicken wings to remove blood and impurities if any. Drain well. Rinse and soak in cold water for 10 minutes. Set aside. In a deep pot, pour in light soy sauce, dark sauce, water and wine. Add Sichuan peppercorns, star anise, bay leaves and rock sugar. Bring it to a boil over high heat. Add in chicken wings. When it boils again, reduce heat to medium-low, and simmer for about 15 minutes, or until cooked through. Turn off the heat. Let the chicken wings sit inside the pot and steep for about 15 to 20 minutes. The wings will take up more flavours of the sauce. Serve hot and enjoy! 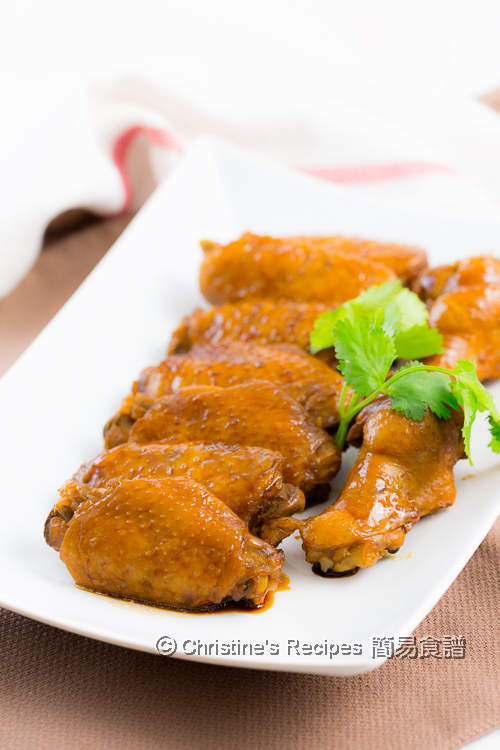 By immediately soaking the chicken wings in cold water after blanching, it helps the chicken skin keep nice and crispy. You might leave the chicken wings in the sauce for a while and let them take up more flavours. But you can serve them immediately if you run out of time. Rock sugar is highly recommended. It will produce glossy and shiny look. It’s available at Asian grocers. The leftover sauce can be kept in fridge for a week or so. 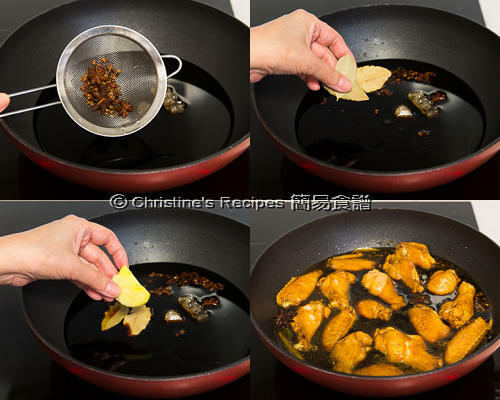 The sauce can be reused to cook chicken wings again, or hard-boiled eggs if you want. Add certain amount of water if necessary because some water will be boiled away for the first time. How fun! Didn't know the story behind the Swiss Wing...they look fingerlickingly delicious.